A disentanglement puzzle is a type of mechanical puzzle that involves disentangling one piece or set of pieces from another piece or set of pieces. The reverse problem of reassembling the puzzle can be as hard as-or even harder than-disentanglement. There are several different kinds of disentanglement puzzles, though a single puzzle may incorporate several of these features. 30 different styles metal brain teasers in 1 box. Having 30 pieces spreads the difficulty throughout the kit providing a good amount of fun and challenge! It is such a great classic game that never gets old! Teasers rank from fairly simple to difficult. An amazing intelligence game to develop thinking and manipulative ability. Designed for children, teens, students and adults (Small parts. Not for children under 6 yrs). Try this new strategy game in your spare time to save your eyes from harm of electronic product's display. Linked together these wire pieces and do come apart with the right strategy. Patience is a virtue. Metal teasers come with plastic storage bin and all of them are individually wrapped with opp bags. Non-woven bag is included for storing the teasers conveniently; Instructions are also included to explain the solution for each one. The metal teasers are made of 70# HCS (High-Carbon Steel) to provide high strength and toughness properties; LEAD-FREE. Smooth edges avoid hand injuries and nickel plating finish is stainless. They will be bright as new after a long time use. 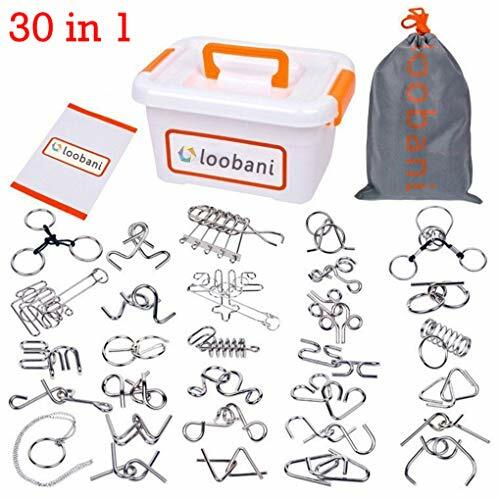 If you have any questions about this product by LOOBANI, contact us by completing and submitting the form below. If you are looking for a specif part number, please include it with your message.